This is such a bizarre subject I thought I had to write about it! 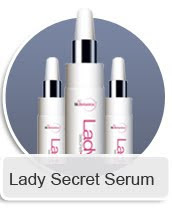 I introduce to you the Lady Secret Serum!! I kid you not. It promises to give you "complete youthfulness and make you feel like a virgin." Since when was this something us women wanted so much that we would spend money on it?! Surely the basic pelvic floor exercises will do the job but apparently not! This is so bizarre I had to share. We have enough to concern ourselves with beauty-wise what with waxing, plucking, colouring, moisturising and general grooming to think of. Now we're being told we have to add an additional "lady cream" to our skincare routine. I really can't see the need for this; it must be the ultimate in vanity. Lets stick to the parts of the body most people can see!! !